Often times the fall season gets a little rushed for me as we all head towards the big Christmas holiday, but this year I have managed to keep my excitement for fall scrapping strong. Yay! And this is totally great for me--I love the fall season and all of the fall themes and photos that it brings. My layout today is an example of all that I love about fall--the colors, the falling leaves, and the sense of gratitude and thankfulness that is forefront in my mind during this time of year. 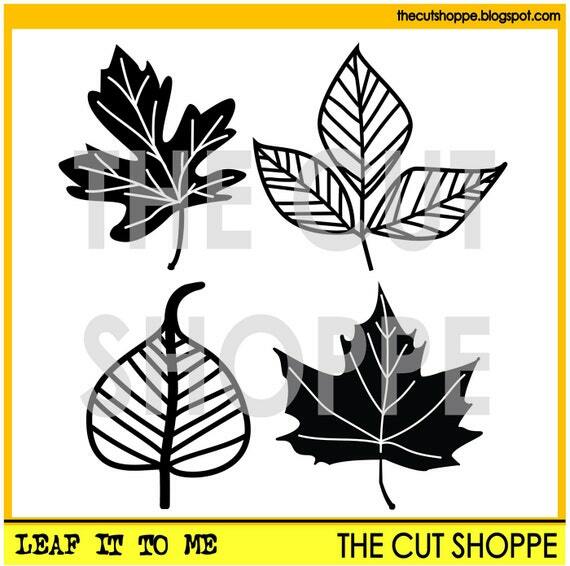 Luckily, The Cut Shoppe has a great variety of cut files to help me tell my autumn stories. I built my layout around the "thankful" title: I wanted it to be pretty big and in a bold plum color, so I went ahead with a simple linear design to let the title shine. By layering the leaves in two spots I not only softend the lines, but I worked in some complimentary colors. If your wondering about how I go about placing my leaf "piles," there really isn't any secret! My goal is simply to make them look like they do in real life. I place a group of leaves in the area I want them to go, make sure they are facing every which way, and then "rake" them into a pile. To adhere I simply hold them into place with one hand and dab a liquid glue underneath in a few spots. This keeps them from all laying flat and gives them added dimension. To add some extra hold, you could also stitch over them. 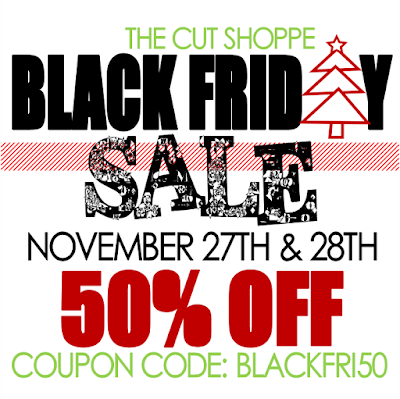 Don't forget The Cut Shoppe is having a Black Friday Sale right now! 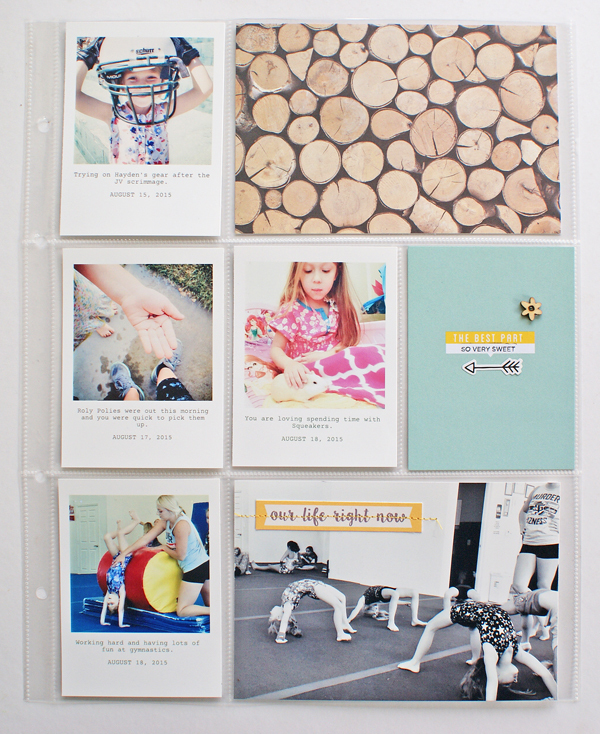 You can save 50% off of your purchase which makes it a great time to stock up on your favorite cut files! Hi! 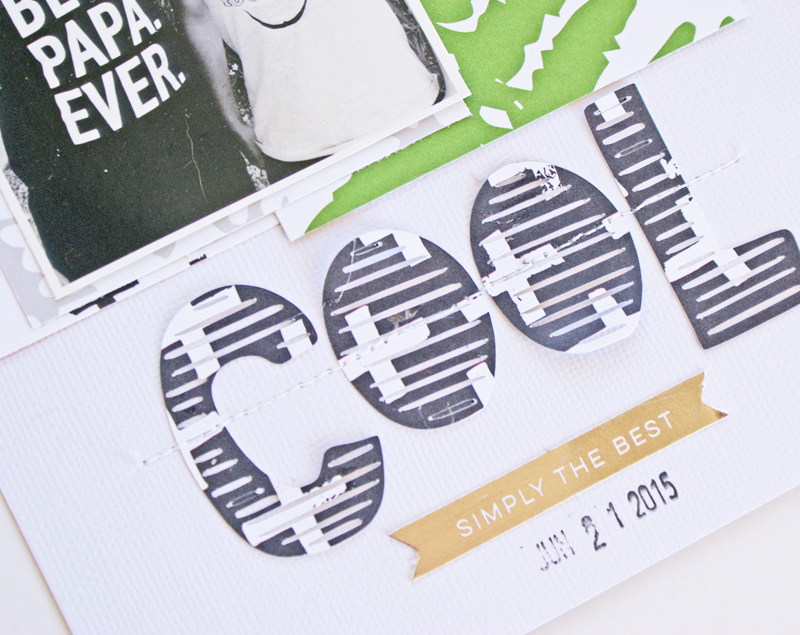 Today I am sharing the second installment of my "Old & New" Series. 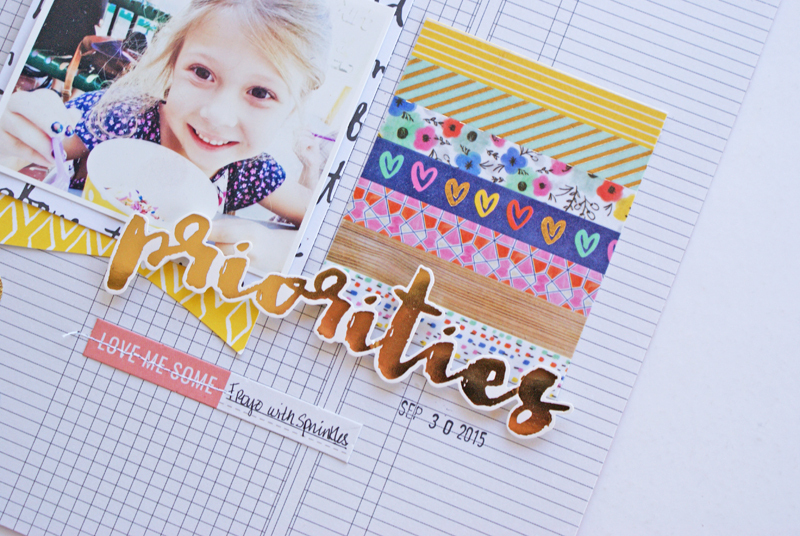 I love watching new scrapbooking supplies role out--nothing gets me more excited than seeing the new releases and then finally getting some of them. The side effect though is that some of my not-so-new supplies get pushed to the back of my mind and they get buried as my brain processes the new "hot" stuff. Lately this has been bothering me quite a bit because a lot of my older stuff is still totally awesome and I want to use it. Last month I really wanted to do something about this and brainstormed a bit on how I could go about using my older stash more efficiently. As I was thinking about possible solutions, I kept coming back to the fact to a few things. First, nothing motivates me more than receiving a box of new goodies--just being honest here. 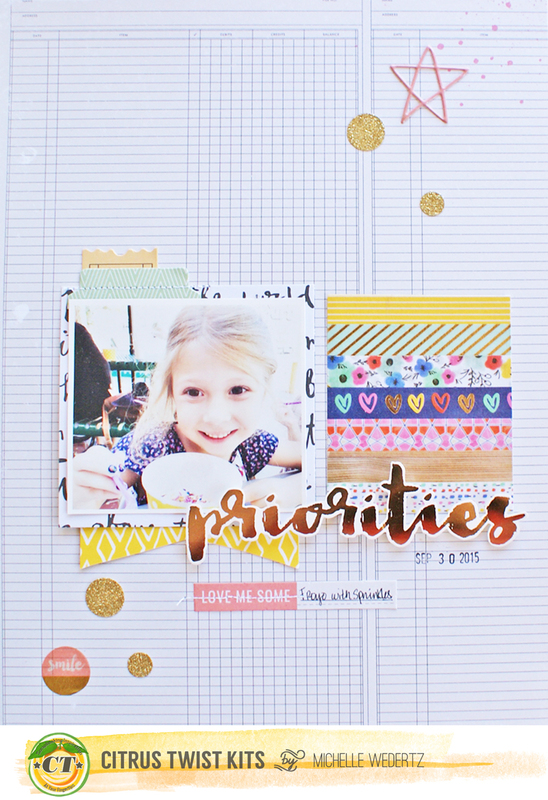 And second, I prefer mixing my products up-it is very rare that I make a layout with only one collection. One solution I came up with-a solution that is in no way mind blowing-is to mix in my new products with my older ones. Wow. I'm a real genious, right?? Ha ha. Well, this is at least something I haven't done in a really long time, so I committed to the idea and hit my stash. This month I pulled out my stack of 6x6 Paper Pads, which includes several older collections from Crate Paper, American Crafts, and Studio Calico. My goal here was to find some older papers that I could mix in with the new colors and motifs from the newest collection from Maggie Holmes. I wanted a variety of patterns. 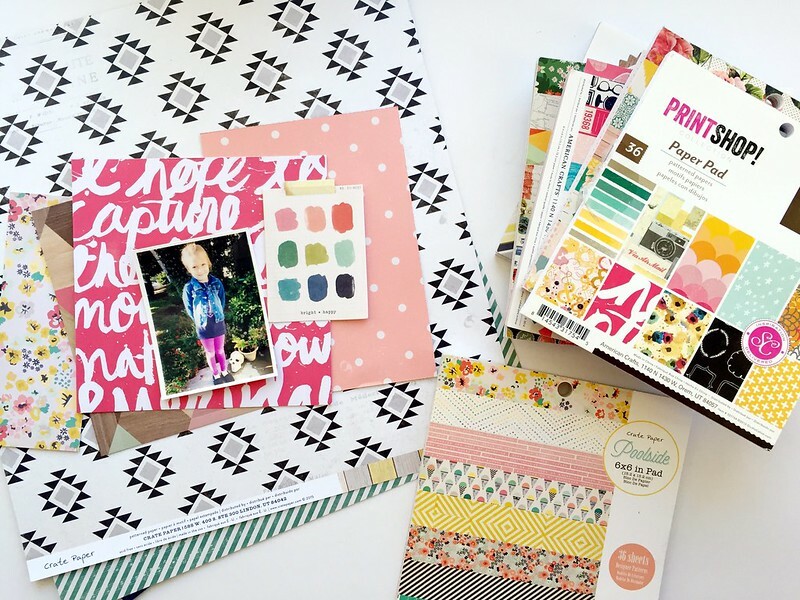 For example, I knew I was going to use the cool black and white tribal paper from Shine, so I ruled out anything that was too geometric; instead I looked for patterns that I hadn't already pulled--you can see I included a floral, a woodgrain, a script, and a polka dot paper. Also, when picking out paper it is always nice to find a piece that includes all or most of the colors you are wanting to work with, which is why I pulled the floral paper-this is an easy way to tie together a color scheme. I wanted to pull in more pink, so I looked for paper in a variety of pink tones. I pay attention to whether or not the papers are cream or white based. I generally have a hard time mixing the two, occasionally I can make it work, but that isn't too often. I always welcome additonal neutrals and the dark woodgrain paper fit the bill. Obvisouly, I did not use all the papers I had pulled out. This is pretty much how I operate all of the time--always pulling out more than I will use (sort of like I buy more than I use!). I ended up really featuring the bright pink script paper from an older SC line and complimenting it with the wood grain paper and the new tribal paper from Shine. Including the tag created enough contrast color wise that I didn't need to really add in any more paper. In the end, I used up only two pieces of 6x6 patterned paper--not a whole lot in the scheme of things, but it felt good to at least put those two to use. Upon reflecting on this project and my goal, I am thinking that maybe another solution to the stack of paperpads is in order. Maybe I can use them to cut diecuts--shapes and titles-for my projects--maybe channel my inner Paige Evans? Or do I need to place them more prominently in my space so I can see them? Any other solutions that you can think of or do I just need to stop buying paper pads?? Wishing you a great day and as ALWAYS, thank you so much for stopping by! Hi! 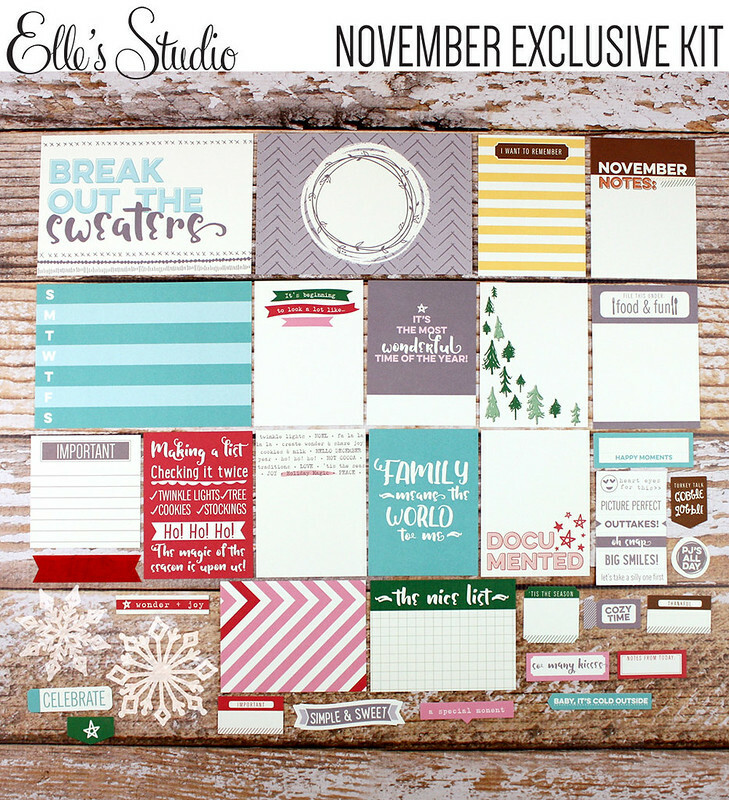 Something pretty new to Elle's Studio is the offering of a monthly exclusive "Mini-Course" designed to help you use the montly kits. Since the Mini-Courses began, I have been pretty impressed with the lineup of instructors ( and the $4.99 price!) and when I was given the opportunity to create a project based off of the most recent Mini-Course, I jumped at the chance! I consider myself a "learner." 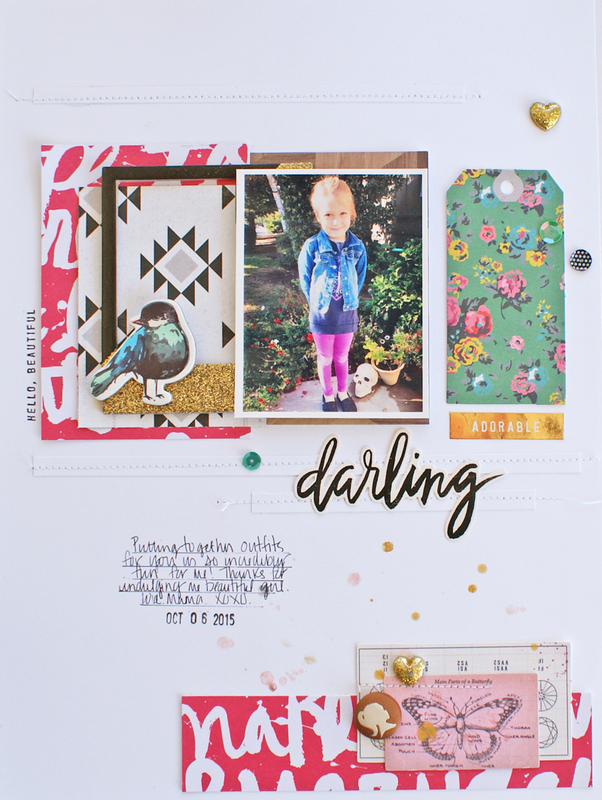 I am a big fan of scrapbooking classes for a number of reasons: First, they offer up new inspiration; Second, they help me work on specific skills; and third, they motiviate me to scrap more. 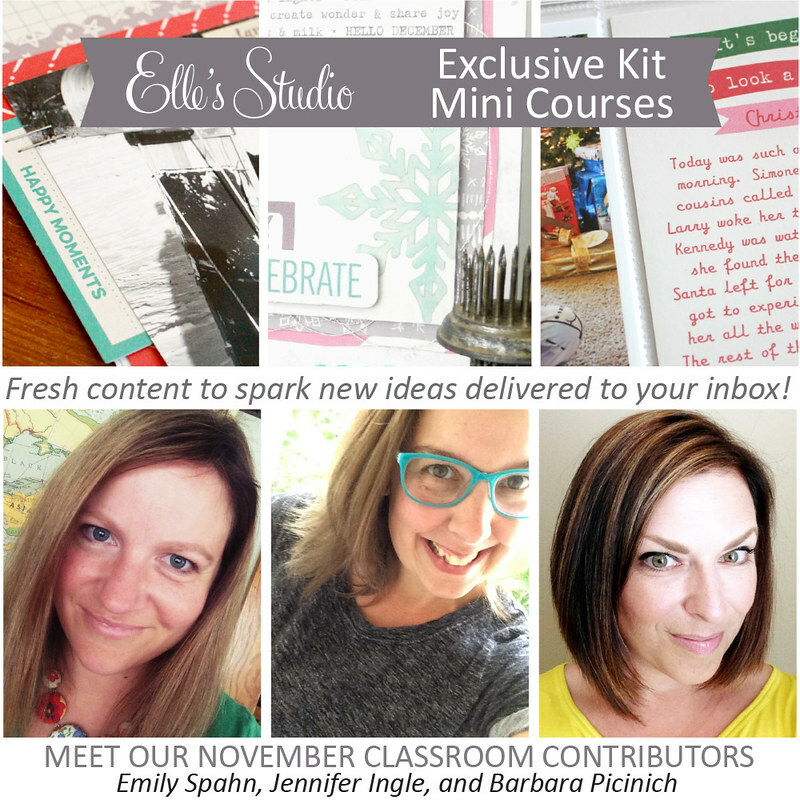 This Mini-Course from Elle's Studio certainly did all three for me! To read a little bit more about my thought process and how I applied the course to this layout, you can see my post here on the Elle's Studio Blog. Welcome to my stop on the November Gosssamer Blue Inspirational Blog Hop! At Gossamer Blue we know that can be pretty overwhelming, so we've come up with a solution-each month on the 15th we are going to inspire you just as you are receiving your kits! 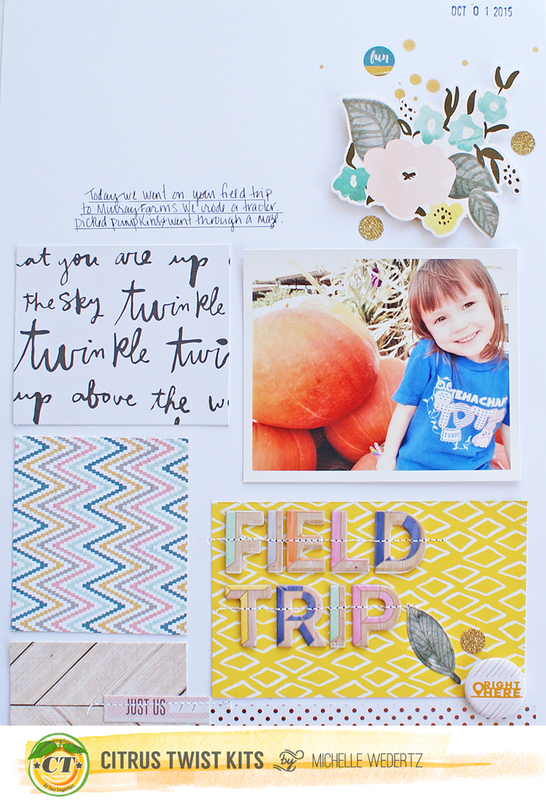 This layout, which is a mix of both the Scrapbook Kit and Life Pages Kit, is really a result of my love affair with my square punch! I started by wanting to use up lots of patterned paper and punched enough squares to fill the page. After pushing them around for awhile I felt this configuration worked the best. 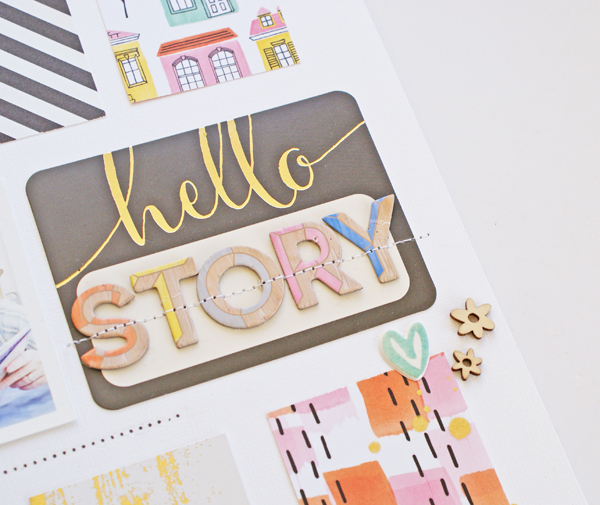 The "Hello" card from the Life Pages Kit was the perfect place for the title and the mix of the gold foil script with the colorful Thickers made for a fun combination. With all the patterned paper going on, I opted for simple embellishments like the puffy heart and wood veneer flowers. My daughter's album, which this will go into, is a mix of both traditional and pocket pages (all 9x12) and after completing this layout I went right ahead and filled the adjacent pocket pages using the November Kits. This spread was really simple and straight forward due to it being pretty photo heavy. As a result I went light with my embellishing, but made sure to include some stitching to dress it up. 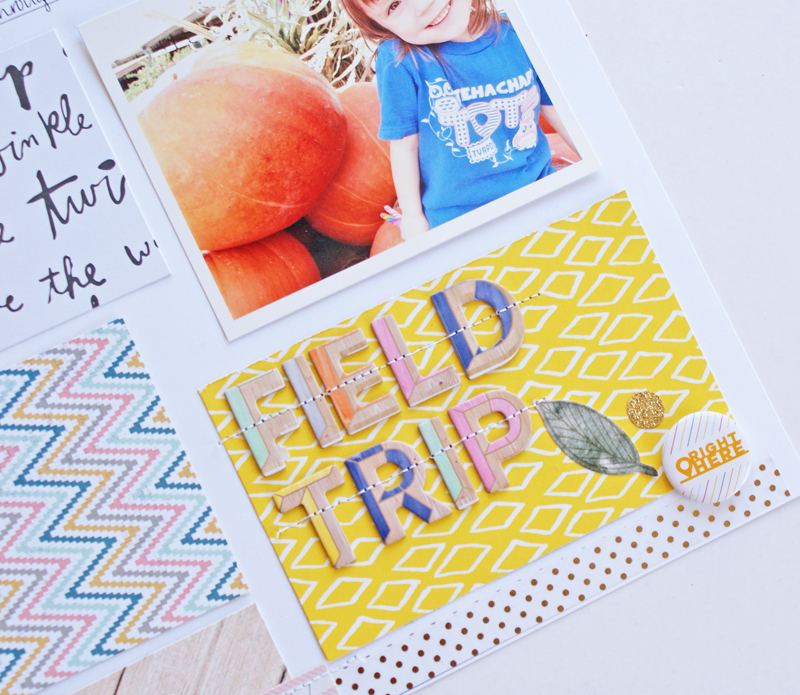 Embellishing this journaling card was as complicated as it got-I simply stamped a sentiment from the Amy Tangerine Roller Stamp, placed a sticker, and glued down a wood veneer. Michelle Wedertz <---You are here! Hi guys! 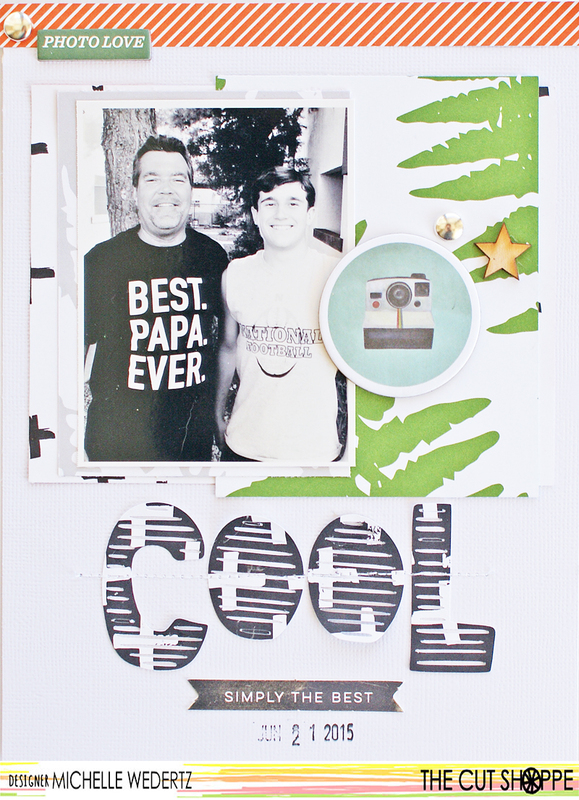 Today I want to share my latest layout for The Cut Shoppe that features a photo of my teenage son and his grandpa. I don't know about other moms of teenagers, but I struggle a little bit when it comes to putting together a layout that accurately reflects the point in life that my son is at. Simply put, I cannot do cheesy or overly sentimental. I have to keep it cool! Ha! Keeping it cool (insert teenage eye roll here) is exactly what I did with this layout by using the Word to the Wise cut file from The Cut Shoppe. This particular cut file worked perfectly for this simple, masculine layout and actually reflects the one word responses I get from the kiddo on a routine basis! When adhering the title I only used a little bit of adhesive knowing that I was going to run the letters through the sewing machine later. I also like the little bit of dimension that is added to the page when elements are lifting off of the background. 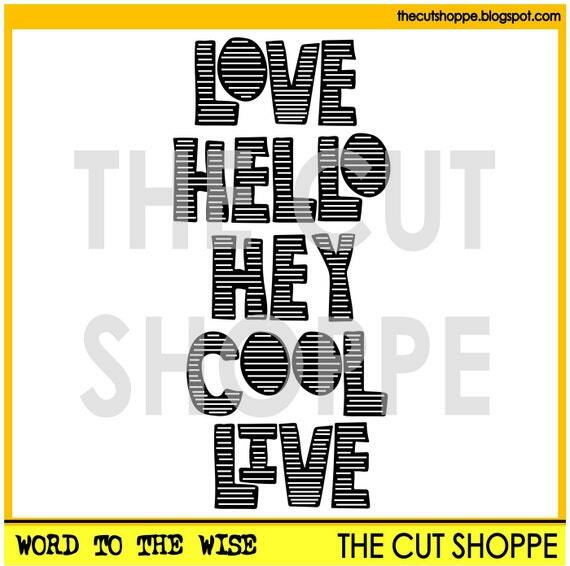 To see even more inspiration for using this cut file, make sure and stop by The Cut Shoppe Blog! 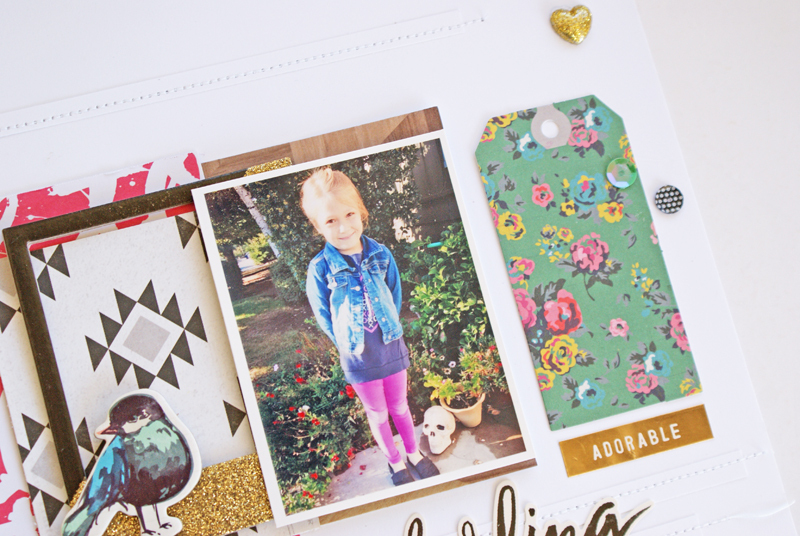 I used the journaling cards and tags from the kit as layering elements behind my photo. 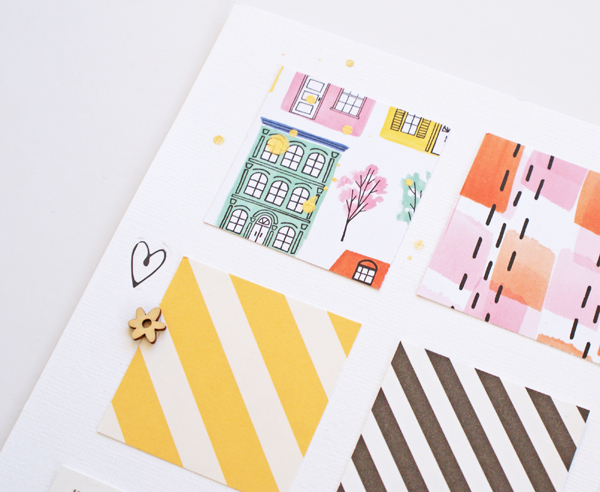 Along with patterned paper from Joyful, I mixed in some vellum and washi from my own supplies. 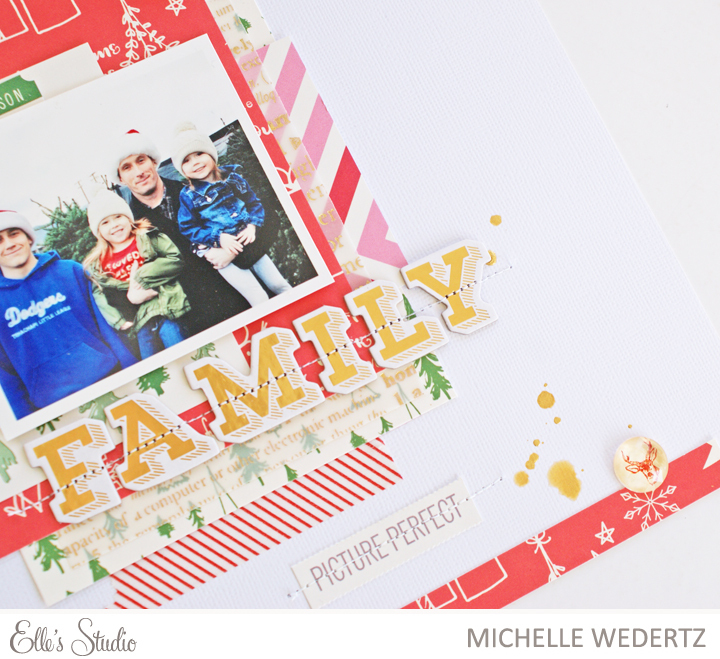 I was super excited to see two vellum snowflakes included in the kit and had to use one on this page since the photo was taken on a super chilly day. 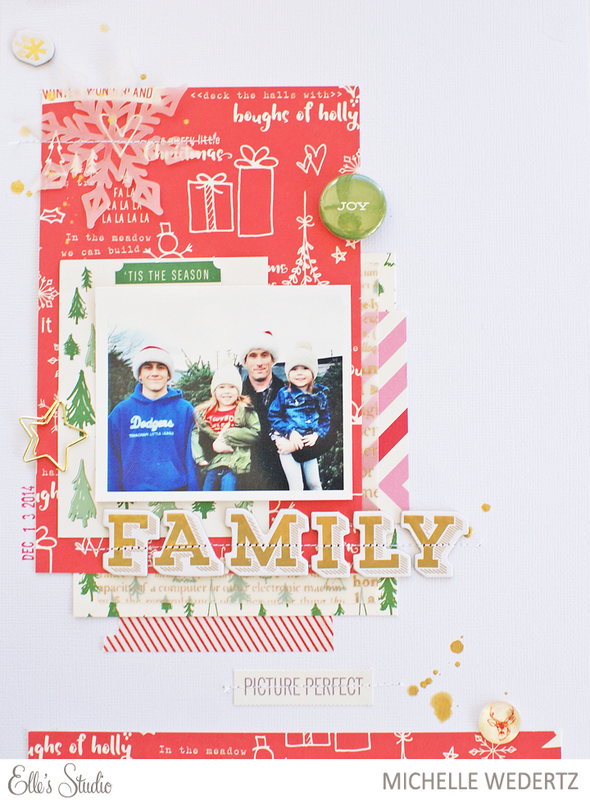 My second project that I made for this month's gallery is a layout created using only the Joyful collection and a few pieces from my wonderful box of Christmas supplies! 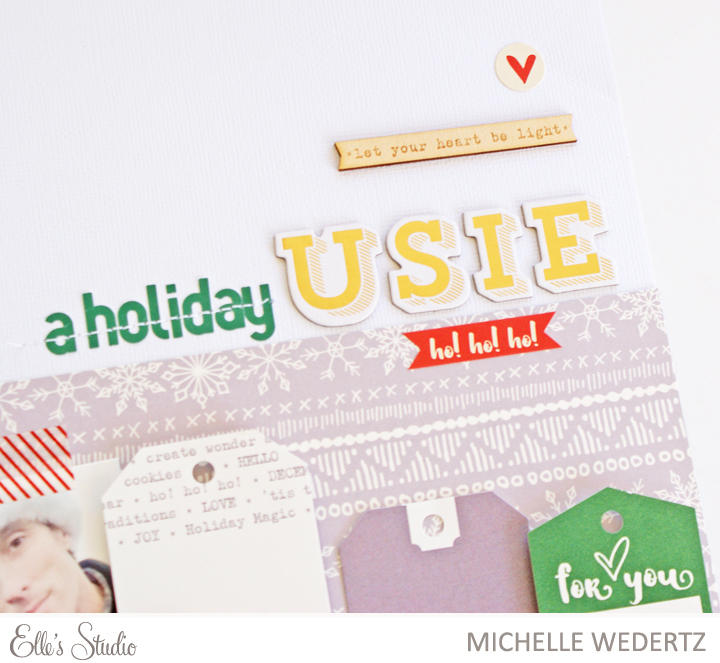 Besides the beautiful papers in the Joyful Collection, I really loved the new green letter stickers--they are the perfect shade of Christmas green and I know they will make regular appearances throughout my holiday scrapping this year. 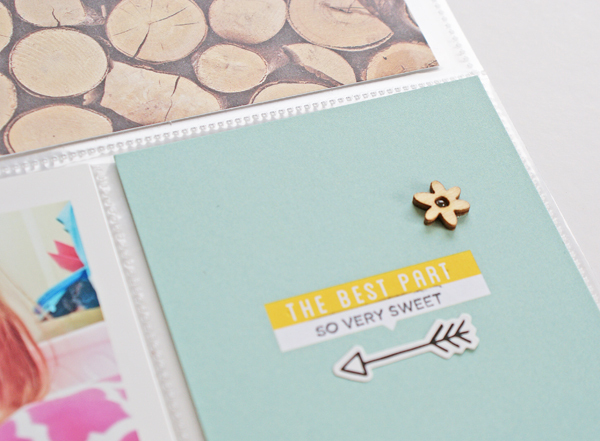 When I went to work on this layout, I knew that I really wanted to feature the tags included in the Bits and Pieces pack from Joyful. 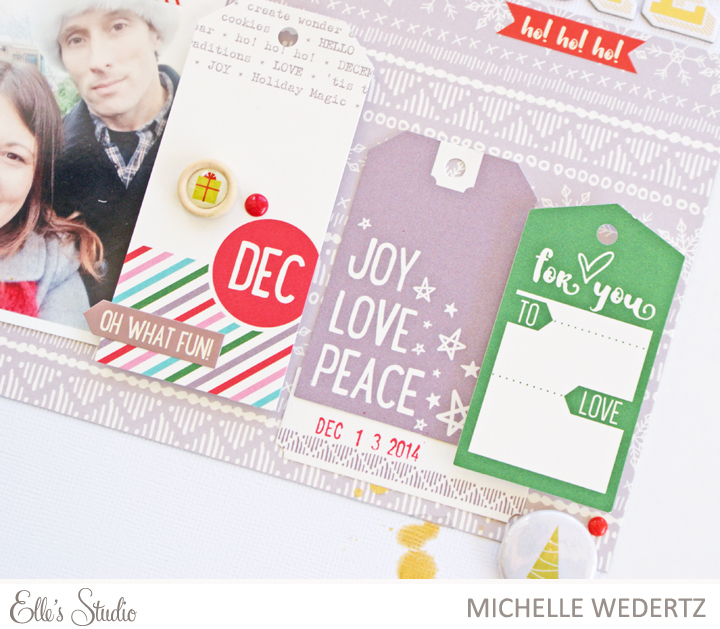 Instead of my usual layering, I made three of the tags a main element on my page. I used pop dots on two of them to add some dimension and dressed them up a bit with some basic elements. I even switched my usual dark grey ink for red when stamping my date! I am super exited myself about this new mini-course. One of my assignments for Elle's Studio this month is to create a project inspired by the course and I am really looking forward to diving in to the class content. 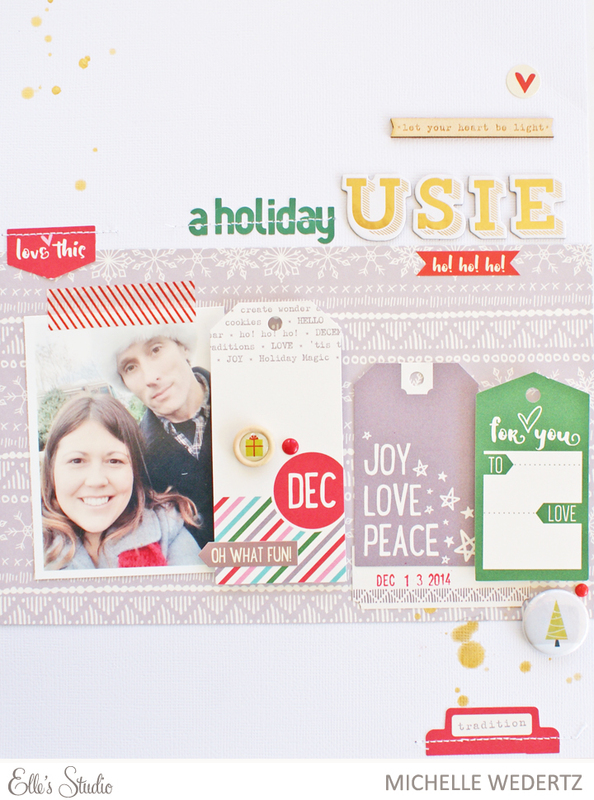 Before I send you on your way, I would like to invite you to hop on over to the new Design Team Gallery at Elle's to see even more inspiration using this month's kit! The color scheme in this kit was right up my alley with the neutrals and pops of yellow and blue. 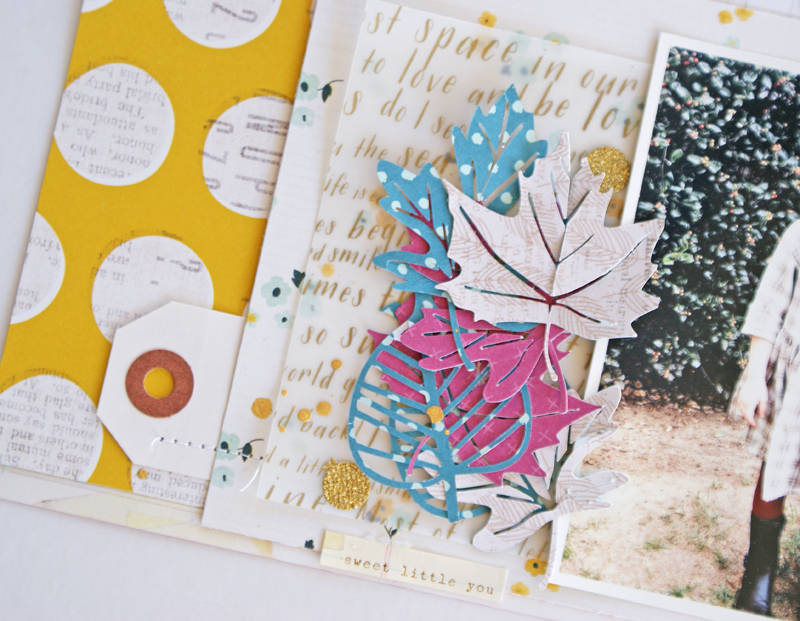 The surprise hit with me this month was the pack of ephemera from Basic Grey's Sunkissed collection--loved every piece of it! For more inspiration, make sure and stop by the both the Gallery and the CTK Blog--our design team is a busy one and there is always something new for you to see!